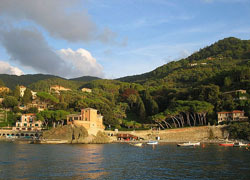 Levanto is located in a large gulf between Monterosso and Bonassola, surrounded by a wonderful Mediterranean vegetation. In 2009 Legambiente confirmed Levanto among the top fifty Italian seaside resorts thanks to its beautiful sea, its artistic and environmental heritage, the quality of services and cultural events. Bonassola is an endlessly in development village, with much regard to the facilities in general, from hotels to bed and breakfasts. Levanto has a very crystal-clear blue sea rich in flora and fauna to observe and photograph, and don’t forget to take photos to the noteworthy marine park of Masco's promontory. The sea is wild and free and offers periodically swells with waves of more than 3 meters from the riding surfing enthusiasts. The coast and its beaches are an added value of Levanto, a large coastline which offers fine sand and pebble, rocks, piers for hunting crabs and beaches and good bathing with any kind of service and comfort.